my mistake, the truvia that I have does not have dextrose in it. It was a Pure Via product. I've been using Stevia since I head an NPR story about it well over a decade ago. At the time there was a kind of push-back from the sugar lobbies and chemical sweetener manufacturers. You could by a Stevia plant, (I did) and there was a veiled suggestion that it was grown by the same people who grew the then illegal other plant. Obviously, the market for weight-loss was too big to keep it down. That said, I learned that Stevia sweetness works for some things and not others -- for me that it. I like it in tea, but hate it in coffee. Others don't. I am convinced that it is a valid and healthy sugar substitute for some things. Also, the liquid seems to be the purest of all. Do a DOUBLE BLIND. It's easy and doesn't cost anything (assuming you have two friends to help). You say your reaction to stevia is "crazy" (and there's a good chance it is). It is certainly not validated by any real science. So, TAKE THE CHALLENGE. If there's something unique about you, PROVE IT. We need that data for the sake of completeness. It could be a rare allergy or something. 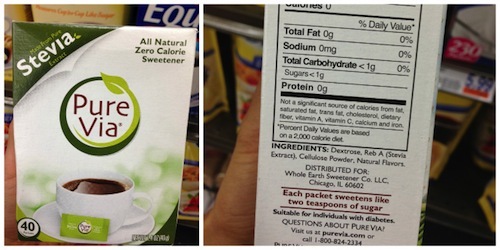 It's definitely not metabolic, since stevia is metabolically inert. I now PREFER it to sugar or any other sweetener, not that sugar is an option. Then again, I don't use it to make things "sweet", just palatable. My Cappuccino or Bulletproof or plain yogurt is just MUCH more pleasant with a little stevia. I don't really like any of those things without. The science on stevia is that it is definitely harmless to diabetics, obviously MUCH better for us than sugar or honey and quite possibly of actual BENEFIT for diabetics. I haven't found ANY reason to drink bitter coffee, sour yogurt, etc. Not in need of "mortifying" my flesh by forgoing "sweetness"! One thing I AM suspicious of, however, is that the FDA only approved a chemical isolate from stevia as a "sweetener" (obviously the HUGE market here) and declined to approve the natural, complete and direct water extract of the leaf as anything other than a "supplement". Pretty weird that something with zero nutrition or metabolic effect of any kind can be sold as a "nutritional supplement". More likely, they did this so the darling corporations can make the big bucks on pseudo-stevia products. They can patent their particular chemistry and fillers, whereas boiling the leaves, filtering and then evaporating the water can be done by anyone and can't be patented. Actually, for teas, just putting dried stevia leaves in the cup along with the herbal or black tea is delicious and works just fine. The natural leaf extract tends to be a greenish liquid and has some other shades of taste that some might not like. In fact, I had it years ago (when sugar and honey were still my sweeteners) and didn't care for it much. I've just ordered a REAL stevia extract product. I would like to adopt that as my go-to sweetener. I read that the level of micro-filtration before evaporation can have a big effect on the final product.